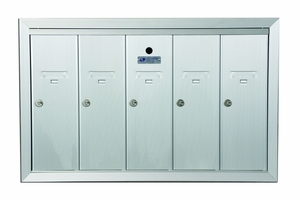 These locking Recessed Vertical Mount Mailboxes come in 3 door, 4 door, 5 door, 6 door and 7 door variants. 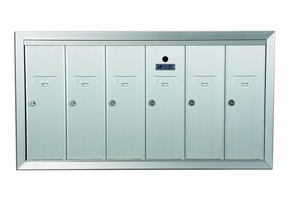 These commercial mailboxes are perfect for condominiums, dormitories, stadiums, gyms, amongst others. To order retail or wholesale vertical mailboxes, send us an email, give us a call, or have a chat with a live assistant. Question: Do you have 8-compartment vertical mailboxes? Answer: No, sorry, verticals don't come in 8 doors. Question: I am searching for the vertical mailboxes for 8 units. Since the maximum is for 7 mailboxes, would this mean that I would need to order 2 units of the 4 mailboxes to cover all of the tenants? Answer: Yes, unfortunately there is not an 8-door vertical mailbox on the market so 2 of the four doors units would be the typical solution. Question: Can I get an 11-door vertical recessed mailbox? Answer: No, you would need to get a 5 and 6 door unit. Question: Do you have 9-compartment boxes that are 4 inches wide and 15 1/2 inches high. Answer: The largest vertical being made now is a 7-door unit. The previous style has been discontinued. Question: What are the finishes available for the front loading vertical mailbox? Answer: These vertical mailboxes come in brass, aluminum, sandstone, green and bronze. Thank you. 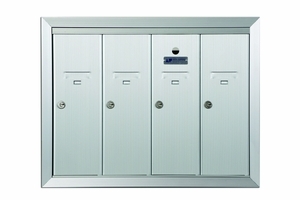 Question: I need a Salsbury Industries 4-door recessed USPS vertical mailbox that has a textured brass-color finish. I can send a photo if you reply with an email address that I can send an attachment to. The texturing is in the form of corrugated vertical ribs. Question: If I buy a 3-door vertical recessed unit from you, where do I get the doorbell buttons from? The buttons I have now are broken and are on a strip that is directly below the mailboxes. It's about 0.5 inches tall. Answer: There is an option to add the push button doorbells. They are installed into the individual doors of this unit. Question: I'm looking for a 4-door recessed mailbox with dimensions of 16in x 17in? Answer: Regulations changed and so did the dimensions of these boxes. Only a few manufacturers still make this style for private use only. Question: I bought a 4-door unit about 10 years ago and had it installed but never used it and have now lost all the keys. It is currently open. Is there a way to buy replacement keys for this? Answer: You will need to purchase new locks if you no longer have the keys. 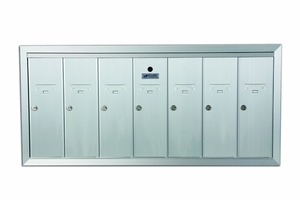 Question: Do you have 8-door or 9-door vertical recessed mailboxes? Answer: No, unfortunately the largest vertical mailbox offered is a 7-door unit. Thank you. Question: I need 8-door recessed vertical mailboxes. Answer: This would have to be a custom order request from the manufacturer. Vertical mailboxes do not come standard in 8 doors. Question: I now have a three-door unit. I would like to purchase a single-door unit for an additional apartment added. Answer: The smallest vertical unit we sell is a 3-door unit. Question: What are the measurements for the 5-door recessed vertical mailbox? Answer: The Auth-Florence brand is 17" h x 27.5" w 6" D, and the Salsbury is 29-3/4" W x 19" H x 7-1/2" D.
Question: Do you have 51-compartment vertical mailboxes? Question: Do the semi-recessed mailboxes come with push button bells? Answer: No, only the Fully-Recessed mailboxes are available with doorbells. 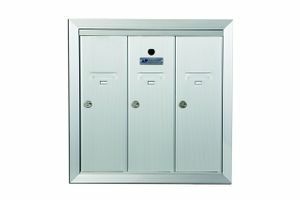 Question: We want a locked outgoing mailbox for each unit and we need 1 5-unit, 3 4-unit and 23 6-unit recessed mailboxes. Can we get a locking one that will not be recessed? Answer: Please call for assistance. Question: I am looking a single-door mailbox; it looks like 6x18 steel door. If you guys have it, just reply. Answer: We do have vertical doors for sale. We would just need to know who the manufacturer is to get you the correct one. Please call for assistance. Answer: You can order a order a box of blanks or you can order a new lock. Question: Do you have high-end boxes for luxury apartments? Answer: Yes, we have decorative CBU's. Question: i need to replace a 10-compartment vertical mailbox. Do you have it? Answer: No, we sell up to a 7-door vertical unit. Question: Do you have the recessed mailbox with outgoing mail? Answer: You can add an outgoing mail door in place of another door. The SKU is: WL-3569BM. You must order a Salsbury brand unit to use this door.